Please request that Tripadvisor change it's location of this property. It locates it directly in Cannon Beach, not several miles south in Arch Cape. 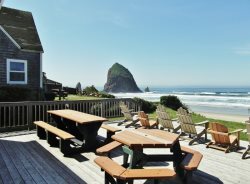 While we enjoyed the privacy and seclusion of the Cape Hideaway, we initially thought it was in Cannon Beach because of the Tripadvisor website. We've used you before and likely will again. I loved staying at the Dolphin Inn South and look forward to returning! Your company went above and beyond to diffuse a potentially vacation destroying situation and we would like to extend our heartfelt thanks and gratitude for the professional, calm and courteous way in which it was handled. Very easy and friendly checkin/out experiences, and no problems with the property at all, apart from the relatively minor things mentioned previously. Everyone at your office was so friendly and easy to work with. Check in and out are very quick and efficient, and it seems like everyone really cares that you have a good time. The Loft is so nice and up to date, not a run-down rental at all. With everything being so nice, from the staff to the quality of the furnishings in the home, it made our vacation that much more enjoyable, relaxing, and FUN!